What is a digestive ultrasound? A digestive ultrasound or ultrasonography is a diagnostic technique that allows the study of various abdominal organs, including the liver, gallbladder and bile ducts, pancreas, spleen and large abdominal vessels, and in some cases, the intestinal loops themselves. It uses a probe (transducer) that emits high-frequency ultrasounds; these, being directed towards the different abdominal organs, are reflected and returned to the probe, and then converted into a grey scale that will form the ultrasound image. 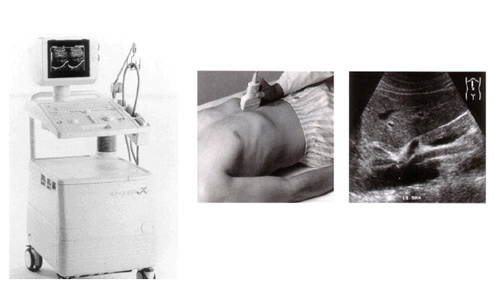 The ultrasound allows images of intra-abdominal organs to be constructed from their interaction with the ultrasound. The concept of gastrointestinal ultrasound refers to the abdominal ultrasound practised by gastroenterologists, with an interpretation of the ultrasound images being integrated into patient assessment, in an eminently clinical ultrasound paradigm involving proximity. What are the indications for performing a gastrointestinal ultrasound? There may be multiple clinical indications for performing a gastrointestinal ultrasound. Among the most frequent is the study of liver diseases, gallstones or biliary diseases, abdominal pain of unknown cause, and so on. Since it is a harmless, low cost and easily accessible test, some clinicians have adopted the abdominal ultrasound as a routine procedure in the evaluation of their patients, using it as a natural extension of clinical history and physical examination. In some situations, the ultrasound may be used as a guide for interventional procedures, such as biopsies of liver nodules or drainage of abscesses or other fluid collections. It should be noted that ultrasound is not an exact science; its interpretation may be difficult in some cases, leading to it sometimes being necessary to run other tests to confirm or rule out a certain suspected diagnosis. How is a gastrointestinal ultrasound performed? The ultrasound is performed with the patient lying on his or her back, ideally in the examination room under calm and darkened conditions. It is a comfortable, painless examination, and can provide a unique opportunity for investment in the relationship between doctor and patient, with the opportunity to answer questions, offer advice and strengthen the bonds of trust. It begins with the application of a specific gel onto the skin to facilitate contact with the probe and facilitate the transmission of the ultrasound. During the examination, the doctor runs the probe over the patient’s abdomen and may ask you to collaborate by taking deep breaths or stopping breathing for a while. You may also be asked to change position during the examination, or to ingest a certain amount of water to facilitate the observation of some structures. The procedure usually takes between 15 and 30 minutes. At the end, the gel is easily removed with a cloth or paper towel. Is any preparation necessary for the gastrointestinal ultrasound?? The patient only needs to refrain from eating for six hours prior to the examination. In some situations, you may be prompted to start the examination with a full bladder in order to facilitate observation of the organs of the pelvic cavity. What are the risks of gastrointestinal ultrasound? The gastrointestinal ultrasound examination is extremely safe, comfortable and very well tolerated. Some patients report only a slight feeling of discomfort caused by the cold gel applied to the skin or the pressure exerted by the probe on the abdominal wall during the examination. This technique does not use ionizing radiation, so it can be repeated as many times as necessary, without injury to the patient’s health.